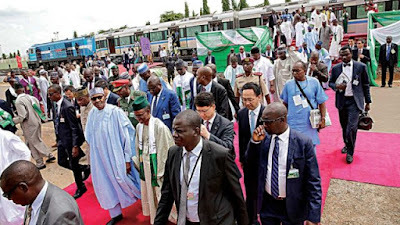 President Muhammadu Buhari yesterday commissioned the 45.24 km Phase 1 Abuja light rail mass transit project awarded on May 23, 2017.Unfortunately, just when the President began his keynote address, the standby generator powering the whole event went off causing some sort of scare in the arena. The light was never restored till the President’s departure.Buhari, in his speech, commended the Chinese Government and its construction firm that handled the project (CCCEC) as well as the China Exim bank for the conclusion of the project. Buhari said: ‘’The project will impact on the people in terms of better transportation, job creation and enhance their social lives.”However, the Peoples Democratic Party (PDP) has flayed Buhari and the All Progressives Congress (APC) for allegedly attempting to claim credit for the rail project.In a statement by its National Publicity Secretary, Kola Ologbondiyan, the PDP said: “Nigerians are aware that the project was conceptualised, initiated and policy-propelled by the PDP. In another development, Chairman, Senate Committee on Land Transport, Gbenga Ashafa, has said that the narrow gauge network, which traverses the entire country, seems not to be functioning at its optimum.Hence, he stressed the need for Nigerian Railway Corporation (NRC) to expedite action on completion of the Lagos-Ibadan narrow rail gauge project. Ashafa said this yesterday in Lagos when the joint committees on Land Transport of the Senate and House of Representatives paid an oversight visit to the NRC and China Civil Engineering Construction Company (CCECC). He said: “In the past three years, we have worked together as partners in the rail revitalisation agenda of President Muhammadu Buhari. This revitalisation agenda has proven to be at the heart at the infrastructural development programmes of the President. “I must say that what we are here to do today is beyond looking into the books and questioning your application of appropriated funds. We are here to confirm the progress we are seeing on paper, prepare a scorecard and come up with workable strategies that would enable us finish strong as a team in 2019.”Ashafa, who urged the NRC to channel more resources towards assisting the haulage sector of the economy, particularly in the transportation of petroleum products, commended efforts of the industry and works of CCECC in achieving the government’s goal. Also, Chairman, House Committee on Land Transport, Aminu Sanni, said the committee in line with its mandate was visiting for the purpose of ensuring that funds appropriated by the National Assembly for the execution of projects by the Ministry of Transport are judiciously utilised.